Wedding hairstyle ideas for mehndi, sangeet, wedding & reception! A wedding hairstyle is one of the most important aspects of a bride’s look alongside makeup. Modern brides are getting discerning by the day when it comes to their bridal look for each wedding ceremony. And that’s why to make sure that you find the perfect bridal hairstyle for your wedding as well as pre-wedding ceremonies, I have curated a bunch of wedding hairstyle images to inspire you to create the look that you always dreamt of! Pre-wedding ceremonies are those events where everybody gets to have fun including the bride and the groom. Haldi and mehndi ceremonies are particularly fun for the bride as she gets to wear two other outfits and have two separate looks apart from her main wedding look. 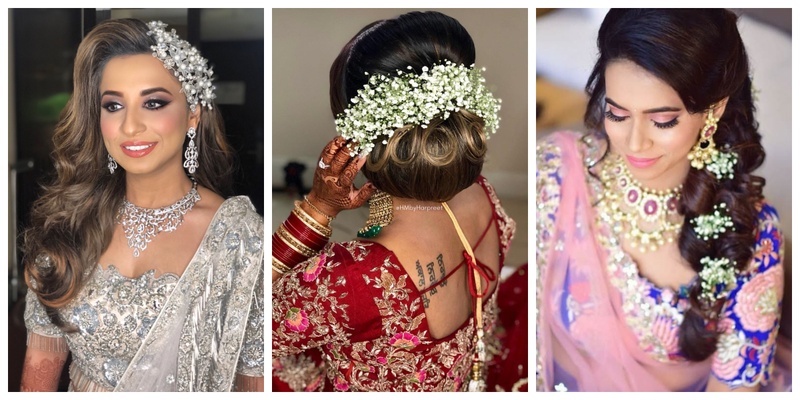 While trending mehndi outfits are something most brides are in touch with, here are some latest bridal hairstyles you can get done on your mehndi or haldi ceremony. How about baby braids with sun-bleached curls giving total Coachella vibes for your daytime mehndi? Or a wedding hairstyle with loose open curls and half braid? This simple wedding hairstyle with open curls and a blingy hair accessory is perfect for mehndi or haldi as well! Or if you want a modern look with your bridal hairstyle, then you can try something like this: Braided crown with loose curls and a floral tiara! Not a fan on open hairstyles? Here’s a French-braid woven into a ponytail that you can pull off with a chic indo-western outfit like dhoti pants and jacket blouse! If you have long tresses like Rapunzel, then you can give this wedding hairstyle with half-braid and loosely open hair with flowers a try. Or if you wish to try something that’s chic and elegant, go for a bridal updo that keeps hair away from your face. Side-swept curls with a big puff also work wonderfully for brides who want to add volume to their bridal hairstyle! If you fancy a fully braided bridal hair style, then this voluminous braid with baby’s breath is something you will surely like! How about a wedding hairstyle with a braided crown that is woven into a fishtail braid and accessorised with cute pearls? Yet another bridal braid hairstyle with flowers and baby’s breath! Totally trending stuff, I say! Why not just have beautifully blow-dried curls with floral hair jewellery as your mehndi hairstyle? Tight curls, half braid and a pastel-hued riot of flowers! What’s not to love in this bridal hairstyle? Sometimes sticking to the basics looks amazing too! This simple fishtail braid with no accessories is as stunning as the other braids, right? If you have fine hair and want to create major volume, then this Indian bridal hairstyle with dainty flowers is something you can try for your mehndi or haldi ceremony! Cocktail parties and sangeet nights are the ‘jaan and shaan’ of every wedding. This is where most of the fun takes places and both sides of the families gel along to have a gala time! And this event is yet another reason for the bride to doll up and look like a million bucks. While most brides prefer wearing ball gowns, here is some wedding hairstyle inspiration that you can save for the cocktail party/sangeet night of your wedding. Doesn’t this bridal hairstyle with side-swept curls look beautiful with the bride’s jazzy outfit! Totally worthy of the cocktail party look. If you’re not a fan of heavy and OTT wedding hairstyles, then this bridal hairdo with open waves and a simple golden tiara can be your pick for cocktail. Or you can even try curling your long hair at the bottom and leaving them loose without any accessories for a simple yet elegant look. How about trying a big hair accessory that matches your sangeet outfit? This bridal hair style is for all you ladies with a gorgeous bob! Simply blow-dried hair with a side fringe! Curled-up bridal hairdo with baby’s breath and white roses is a stunning bridal hairstyle to wear for your sangeet ceremony. Tight curls with a passa is also a great wedding hairstyle for your sangeet night! Big voluminous curls kept open with no accessories is a lovely bridal hairstyle to try for your cocktail night! If you have medium-length hair, then a bridal hair style like this is a great idea. It’s simple and looks stunning when paired with the right kind of cocktail dresses! If you are planning to wear an off-shoulder gown for your cocktail party, then please, please give this personal favourite elegant bridal updo a shot! Thank me later when you’re showered with compliments for your look. The main wedding day is the most important of all your bridal looks. You don’t want to go wrong with this one! Choose an Indian bridal hairstyle that’s in sync with your wedding outfit and makeup so that the whole look seamlessly blends together to make you look like the bride of your dreams! A simple bun with lots of beautiful flowers is the most classic hairstyle for wedding day! It goes with anything from a saree to a lehenga. So, if you are confused with what kind of marriage hairstyle to have on your big day, stick to the basics and you will never go wrong. Tell me you didn’t gasp with awe looking at this bride’s wedding hairstyle! The double-braid crown with bun and baby’s breath is just too beautiful to handle! Braided buns with multicolour flowers also make for a great hairstyle for wedding day! If it’s a Christian wedding that you are going to have, then this bridal updo with a diamond tiara is perfectly romantic to wear under the veil! Curly bun with arched roses makes for an elegant wedding hairstyle to wear for a daytime ceremony. Or maybe a low bun with an arch of baby’s breath? For brides with extra long hair, this South Indian bridal hairstyle with braid, bun and lots of scented white gajra is perfect! This bridal hairstyle with a big braid, side fringe and baby’s breath is a good choice for the main wedding ceremony if you don’t prefer wearing buns. Isn’t this middle-parted simple bun with baby’s breath the ideal Indian bridal hairstyle to go with a stunning lehenga? If you like something more casual, go for this messy bridal updo with a couple of big flowers to accessorize the look. After you have been declared man and wife is when everyone needs a reception party where they can eat, drink and make merry! While brides wear everything from sarees to gowns for their reception, what they can’t seem to finalise is the hairstyle for wedding reception. And that’s why to give you some options, here are the best bridal hairstyles that you can wear for your reception party with almost any outfit. Voluminous side-swept curls with hair accessories is a great hairstyle for wedding reception. Or if you prefer a bridal updo, then this curled bun with a statement hair accessory is also a good idea! For brides with fine hair, this big and messy updo is an elegant hairstyle for wedding reception, especially if you are planning to wear a gown instead of going the traditional route. For brides who swear by minimalism, this romantic loose curls with middle part and a delicate maang tikka looks just perfect! Or perhaps voluminous curls let down with no accessories! This hairstyle for wedding reception that’s a messy bun is ideal if you are planning to have a modern bridal look! If you are planning to wear a saree or lehenga for your reception, this this low bun with artificial floral accessories looks lovely too. You can even try middle-parted, half-up, half-down long waves with a pretty maang tikka as your hairstyle for wedding reception! Or how about these baby braids with extra-long open wavy hair and a diamond brooch? Hope you found the perfect wedding hairstyle for each of your ceremonies!